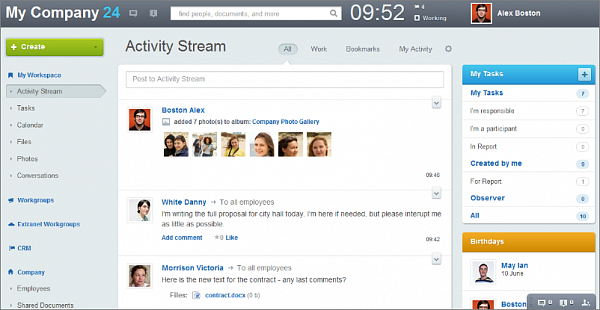 The Activity Stream is the most prominent feature on the Bitrix24 main page. It allows users to be aware of all the current activity with pertains to them. 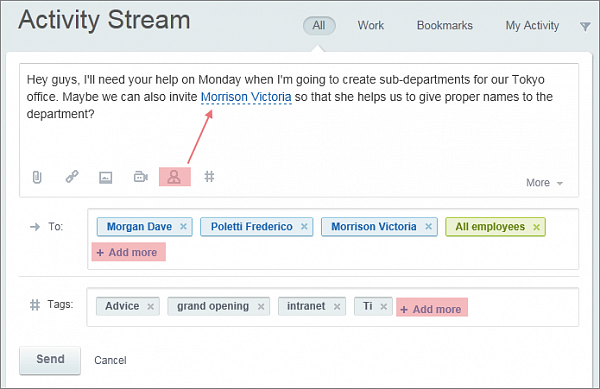 When a message needs to be sent out to everyone, the Activity Stream is the best tool at hand. Simply click the input box at the top and start writing! 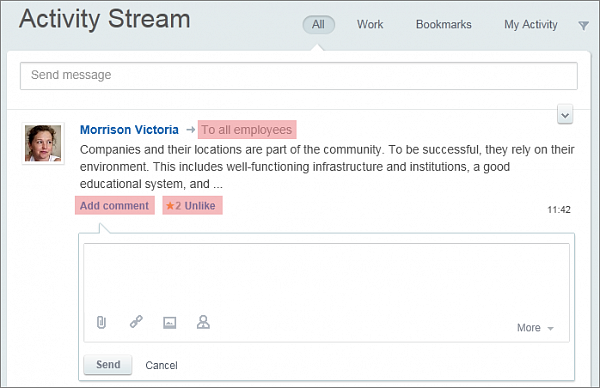 The message will appear in the Activity Stream of all users, and each will be able to add comments or like the message. If a message is intended only for members of a given group, simply choose the group from the My Groups tab and each member will receive the message in his or her Activity Stream. 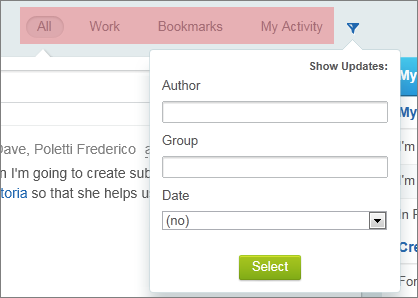 The author of the message can indicate the topic and use the Visual Editor. The message will also appear in the Activity Stream of the group itself. Sometimes, a message needs to be sent to everyone, but particular people need to be specially notified. For this, the “To” field allows the Everyone box to be supplemented by additional users or groups. In this case, all users see the message, but the named users will also receive notification through the mini-panel of internal message system. You can also use the Mention icon to draw the attention of a particular user to a message. Conversations can include text, files, video, images, and links to other materials or to a user. The Activity Stream is interactive and items in it can be commented on and liked. 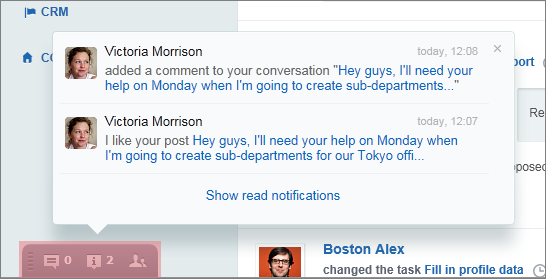 The author of a post can see all comments and likes on posts, and is notified through the internal message mini-panel (high-lighted in pink below). 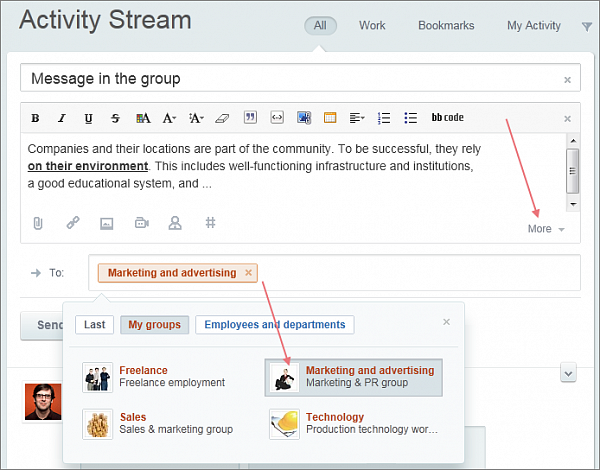 Is something in the activity stream is of particular importance, you can bookmark it and access it in a separate tab. 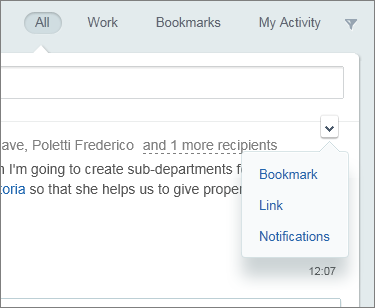 You can also alter the settings to receive notifications of posts from various sources. You can use the tabs at the top of the Activity Stream to filter what is shown.